How do external examiners access student work, feedback and marks stored in a private content area in Blackboard? At Sheffield Hallam University, online submission of student work and online feedback processes are managed using the Blackboard VLE. Work submitted online is stored in, and feedback and grades are uploaded to, the Grade Centre in Blackboard. Students access their feedback and marks using the My Grades tool. This is a private view of a student’s own feedback and marks. Students are informed that marks provided in this way are provisional. There are different ways in which you may be able to access student work, feedback and marks depending on how the module leader has set up the module Blackboard site. This article explains how to access a private content area in which a sample of marked scripts are provided. A separate article explains an alternative approach of accessing student work and viewing the feedback and marks provided to them in the Blackboard Grade Centre. Step 1: Log into Blackboard at http://shuspace.shu.ac.uk using the information provided on the post-induction session email you were sent. 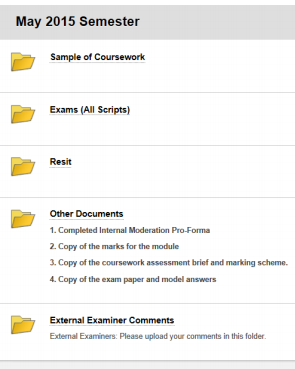 Step 2: In the Blackboard Sites channel, click on the name of the module for which you are external examiner. Step 3: Locate and click on the name of the private content area. The module leader will inform you of the name of this area. Step 4: Locate and click on the name of the folder containing the sample of marked scripts. The module leader will inform you of the name of this folder. The sample may containing copies of student work that have been graded with an inline grading tool, Crocodoc. With some browser and settings combinations you may not be able to view the annotations through the link. To solve this right-click to save the file and then right-click on the saved file and choose open with Adobe Reader. The annotations will now be visible. How do external examiners access student work, feedback and marks provided in the Blackboard Grade Centre?